CPCS hosted our 5th annual Peace Practitioners Research Conference, with this year’s theme of Revisiting Reconciliation: Making It Real. 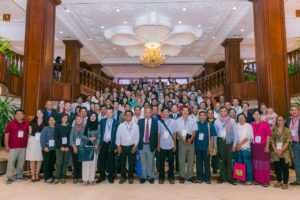 The conference featured a range of speeches and panel presentations to explore further regional perspectives on reconciliation, and how such perspectives are translated into specific approaches to reconciliation and healing. “It is up to us to get serious about our practice if we think we can make a difference, if we think we can stand up and claim to be peace practitioners at all. It is about showing up every day and being serious about this field… That ‘s what we do. We show up, we make it count, we work hard, and we try as much as we can”. John Paul Lederach, a highly respected and knowledgeable leader in peacebuilding, shared his experience of reconciliation with participants via Skype at the PPRC. John Paul Lederach has inspired peace practitioners across Asia for a number of years and is widely known for his pioneering work in conflict transformation. Lederach is involved in conciliation work in Colombia, the Philippines, and Nepal, plus countries in East and West Africa. He has helped design and conduct training programs in 25 countries across five continents. In August 2013, Lederach was appointed director of the Peace Accords Matrix, the Kroc Institute’s unique source of comparable data on all comprehensive peace agreements that have been signed since 1989. Lederach is the author of 22 books, including When Blood and Bones Cry Out: Journeys Through the Soundscape of Healing and Reconciliation, (University of Queensland Press, 2010), The Moral Imagination: The Art and Soul of Building Peace (Oxford University Press, 2005), The Journey Toward Reconciliation (Herald Press, 1999), Building Peace: Sustainable Reconciliation in Divided Societies (USIP, 1997), and Preparing for Peace: Confliction Transformation Across Cultures (Syracuse University Press, 1995). He holds a Ph.D. in sociology from the University of Colorado (1988). Stein Tønnesson is a Norwegian peace researcher and historian who has focused much of his career on Southeast Asia. His doctoral thesis, defended at the University of Oslo in 1991, was on the international history of the Vietnamese Revolution in 1945. His main areas of research are Vietnam, Myanmar, nation building in Southeast Asia, and the disputes in the South China Sea. In the years 2011-16 he leads a research program at the University of Uppsala on the ‘East Asia Peace’ since 1979. A video pressenting the program may be seen at https://www.youtube.com/watch?v=PZLQ0vmxi68. He has also worked on energy security and has served as a consultant to several Norwegian companies. From 2007-15, he served on the board of Norfund, a state-owned development finance institution (DFI).